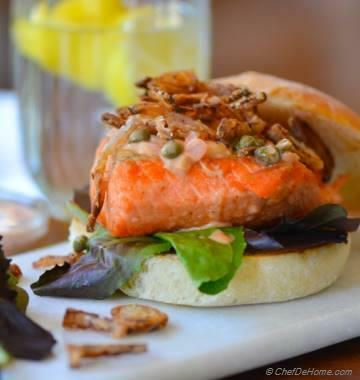 Grilled Salmon is famous for a reason – its celebration of health and taste at the same time. 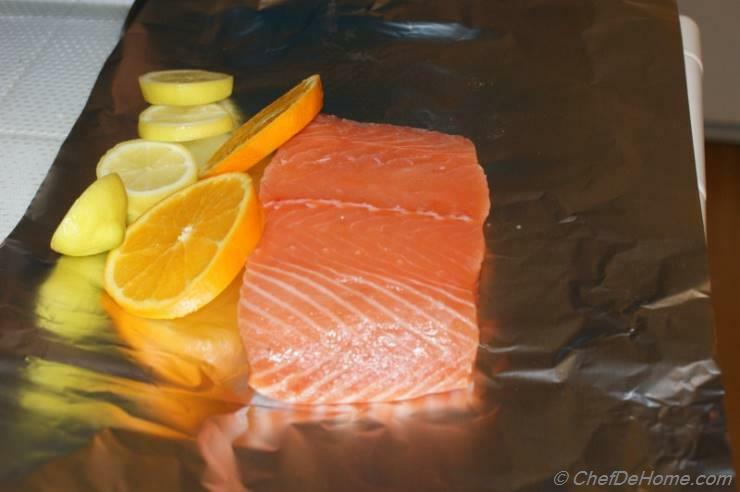 In my opinion, omega-3s rich seafood should be cooked with less oil and lots of citrus and that’s what I am show casing in today’s recipe – Salmon wrapped in foil and grilled with lots of citrus flavor- lemons and oranges, and fragrant with thyme and garlic. As you cut open these foil pockets (keep your face away from escaping steam) citrus aroma with garlic and thyme hits you and make your palette salivating to bite into it. This recipe is perfect for tailgating or Sunday family cookout. Keep the salmon foil pockets ready and just grill’em before serving. 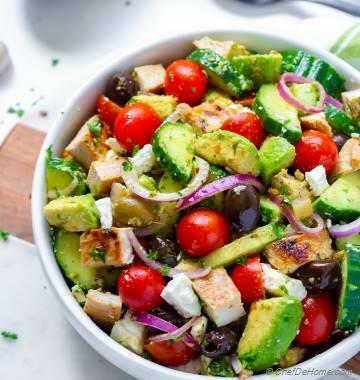 Perfect lite, healthy and entertaining idea whether you’re on your own lawn or a parking lot. 1. Preheat gas or charcoal grill. 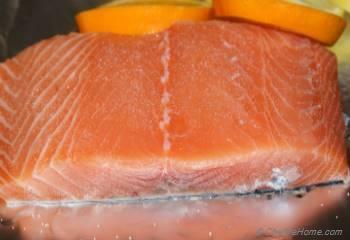 Brush top and bottom of salmon fillets with olive oil (or oil of your choice) and place on a aluminium sheet. 2. Season with salt, black pepper. 3. Top with 2 lemon slices, 2 slices of orange, 1-2 cloves of garlic (slightly crushed), 1 tablespoon of lemon juice, red pepper, and thyme. Repeat for rest of the pockets. 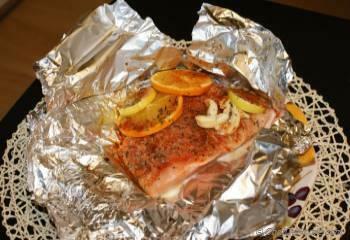 Wrap up salmon tightly in the foil packets. 4. 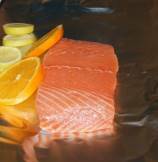 Place the foil packets on the medium-hot grill and cook for 8-10 minutes for a 1-inch thick piece of salmon. Once done, open pocket carefully. Discard garlic if you don't like. Serve while still hot. 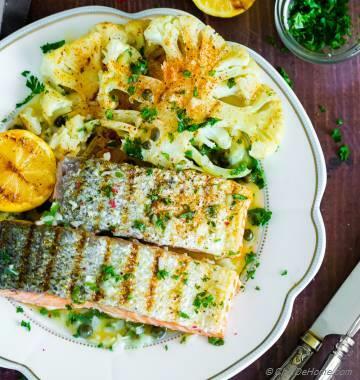 Squeeze lemon and orange onto salmon before eating. Thanks @penny, less is more, so you said it all :) Have a great day! Yum! That's all I want to say. 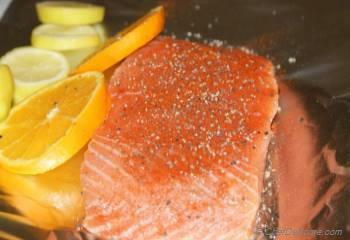 I always bake salmon pockets, never thought about grilling, nice idea!! You make food look so delicious Savita!!! And I love you creative ideas. thanks for sharing your world with us. 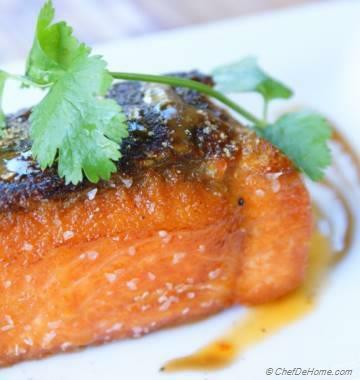 I love game days and love Grilled Salmon, got to try this recipe. thanks. 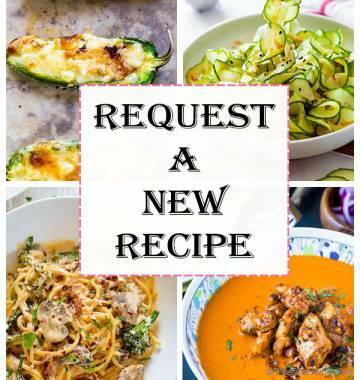 I found you via ogleogle com, love your website, you have good collection of recipes. 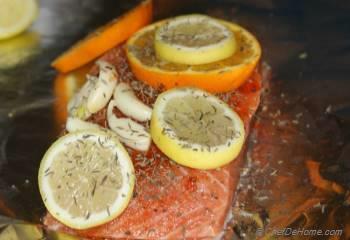 loving it, Grilled Salmon with Citrus is my alltime fav.